The new page is designed to make browsing simpler and more fun for the younger set. 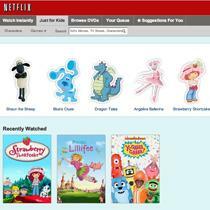 The folks over at Netflix have been working hard to improve their streaming service and the upcoming addition to browsing on PC should make things much easier for parents and children alike. A new option called "Just for Kids" will be added to the top menu bar and clicking on it will bring you to a whole new interface aimed at younger kids. You'll be presented with a menu that shows popular kid's shows using easily recognizable images of characters from the show. Once you've selected a character you'll see a list of episodes with screenshots above them to provide a simpler way to browse for those that can't yet read. The new option is already live on some users accounts in the same way that Netflix usually rolls out these test updates.